Welcome to another adventure of The Traveling Tote. 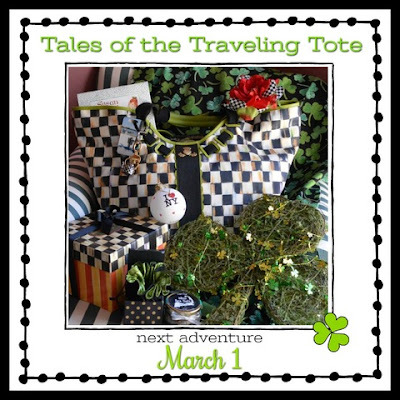 We are a group of women who share our travels with our totes. 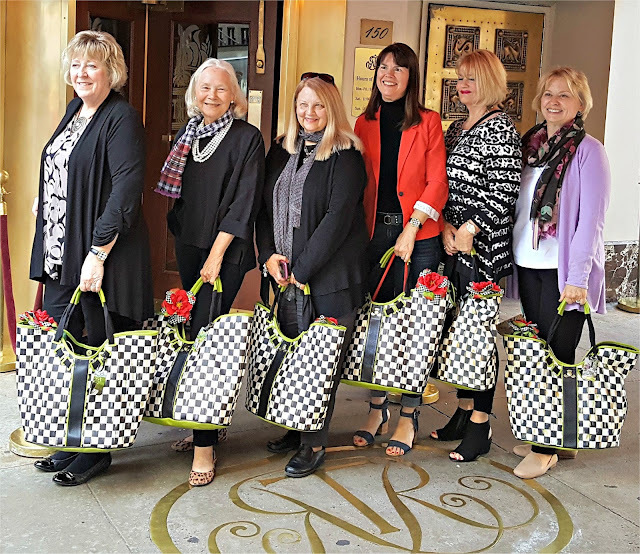 We each have a Mackenzie Childs tote bag. 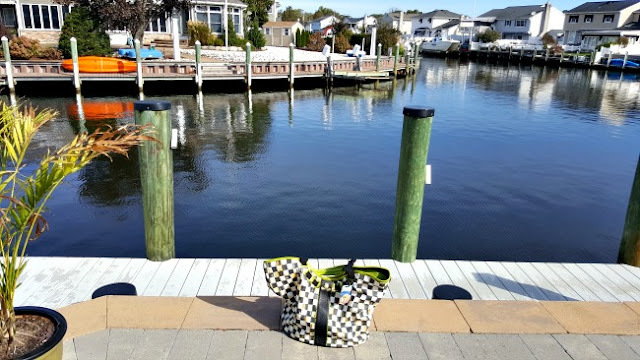 We name our tote and then we share our adventures. We recently welcomed two new members! We girls had so much fun! Our trip to New York City to meet one another was a blast. Highlights again from that post. Here is the original post. 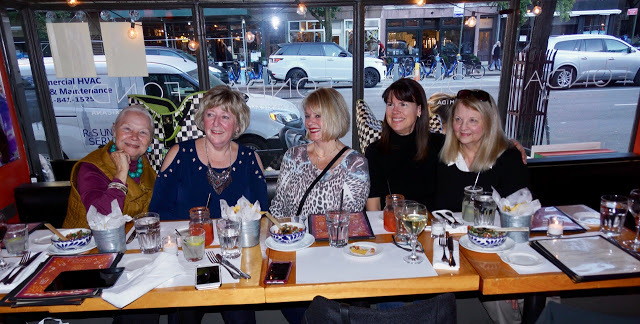 Some of us met up at Fonda, an Mexican restaurant. A perfect way to meet and enjoy margaritas. Sarah , Patti, Myself, Debbie and Emily. 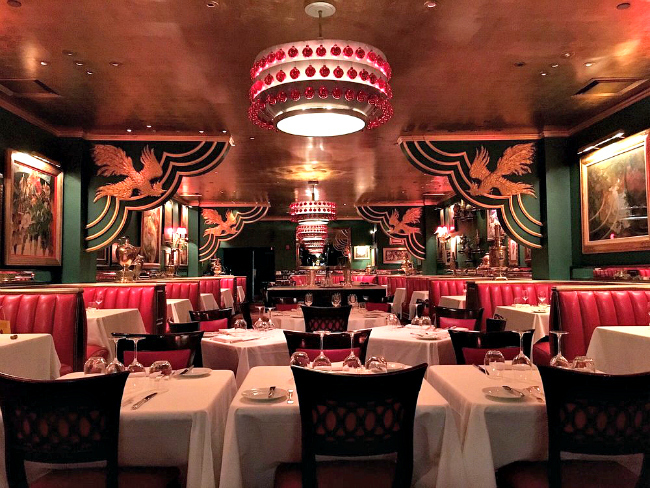 Saturday we all met at The Russian Tea Room. 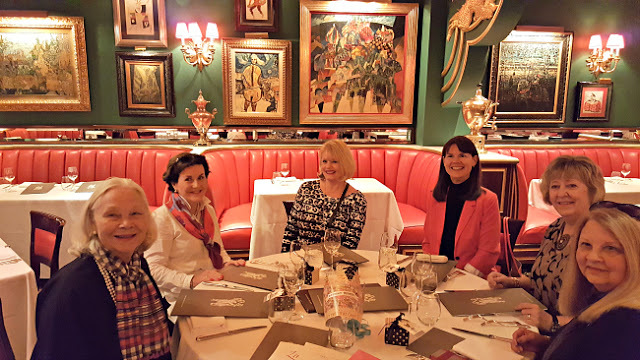 We enjoyed meeting one another and had a delicious brunch. A group photo in front of the Russian Tea Room. On Sunday, my husband and I drove to New Jersey where his brother and sister live. We stayed with his brother and wife, Patti at their lovely shore home for a few days. We visited the Boardwalk, which was quite deserted. This time of year, there isn't much action. 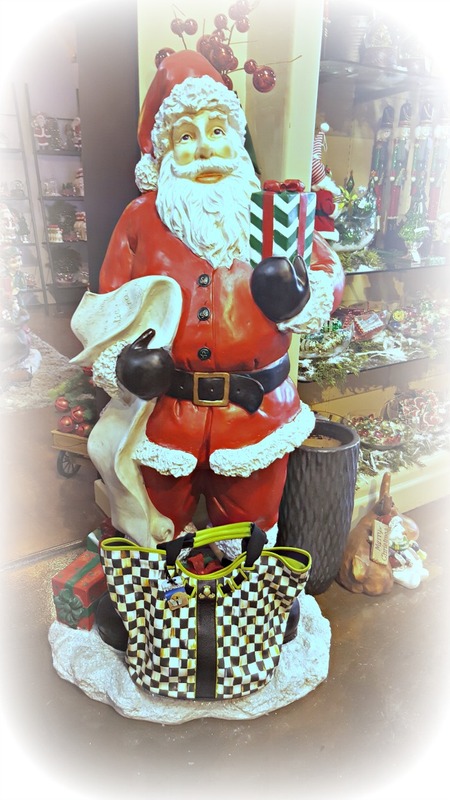 I recently shared the fabulous Christmas decor at my favorite store, Pottery World. A photo opportunity with the very large bear and Miss Lola was a must! Of course Santa had to be included. After numerous photos were taken, I settled on this one of me in front of our fireplace with Miss Lola. Thanks Honey! 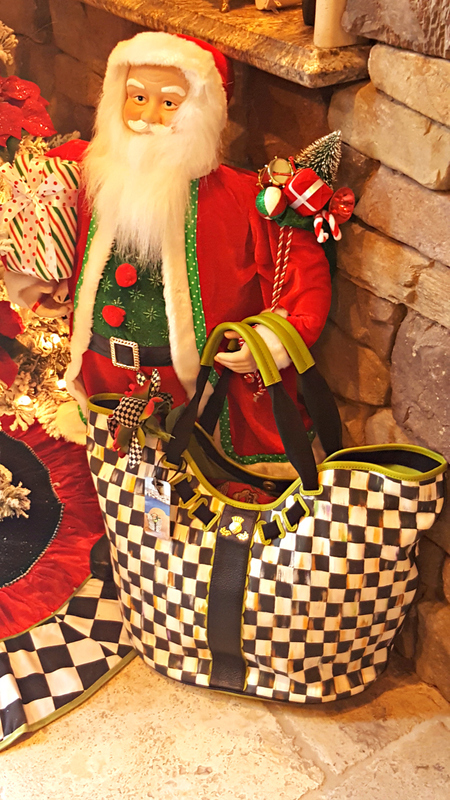 Be sure to visit the other gals to see where their totes took them. Vase. 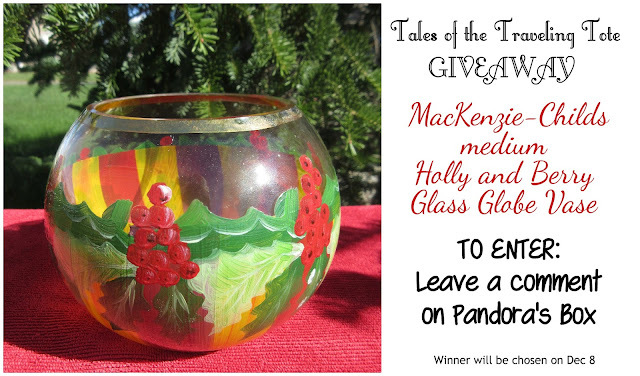 Winner will be announced Dec. 8th. Whoa, Linda! Gorgeous you amidst the gorgeous decor! You must have been a very, very good girl this year. ;) That trip just looks so amazing each time i watch the video. You all looked like true media darlings. How fun for you to be able to get to the East Coast to visit both the Tote Tribe and family. Now that you're back home, I hope you're having fun with all the stash you must've found beyond tempting from the flagship store. Happy Holidays to you, Paul & Miss Lola. This is such a fun idea! 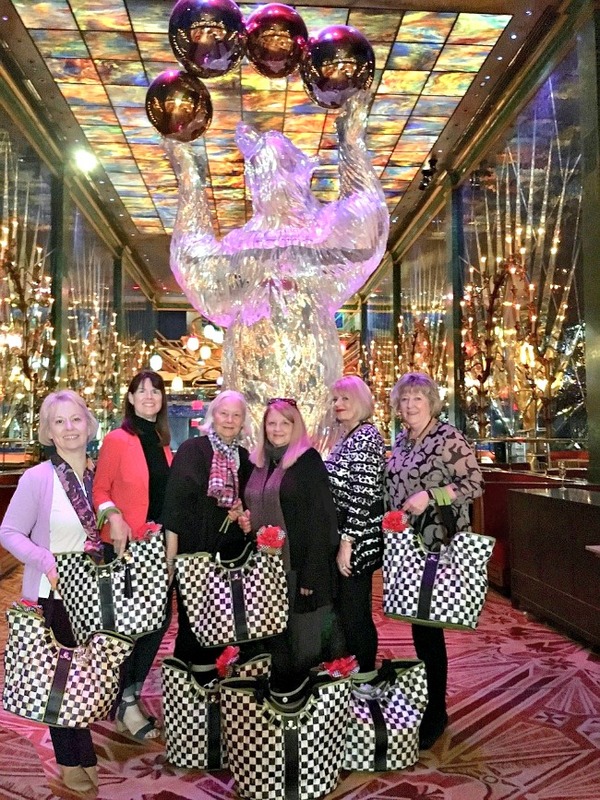 The group photos of everyone with all their totes are marvelous! Hello dear Linda!! The pics are gorgeous. Your mantle is magazine-worthy. Almost as pretty as you! I am so happy that I got to meet you in person and look forward to many more get togethers. Enjoy your weekend. I know you and Miss Lola had such a fun time in NYC meeting up with your Traveling Tote tribe. How special that you and your hubby got time to visit family in NJ, while you were on the east coast. Your photo with your mantle is so gorgeous, Linda. Happy December! I haven't been to the Jersey shop tin years, I will have to add it to my dream travel list! Our NYC certainly was lots of fun! I am so happy our totes brought us together! Happy Holidays and travels! Linda, you definitely won the prize for traveling from shore to shore. I'm thrilled to get to meet you and Paul and to share the fun NYC adventure. 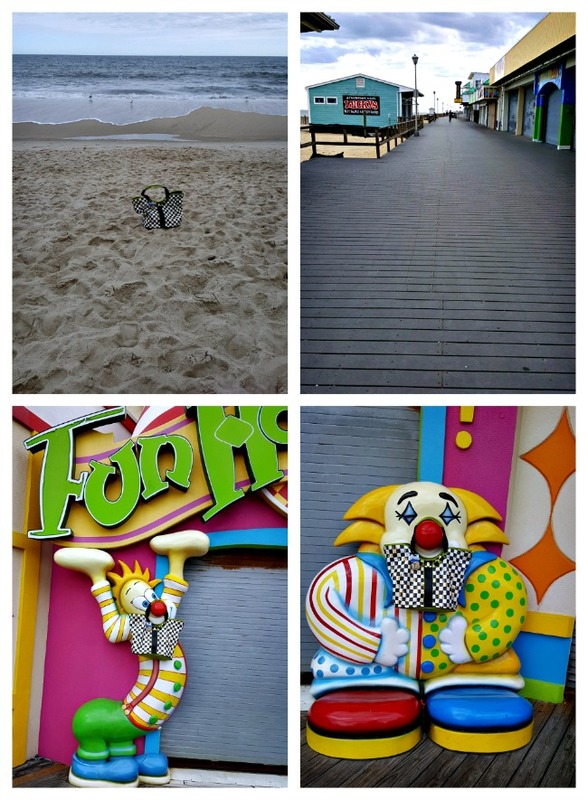 I've never been to the Jersey Boardwalk, but it certainly was a great spot for some photo ops with Miss Lola. Your Christmas decorations are beautiful. Still working on decking the halls here, but the darling Christmas towels are out in my kitchen making things festive! Merry, Merry! Hi Linda, oh you ladies have so much fun with your bags and where you all travel with them. What a great and fun idea for all of you bloggers to be involved in. I loved looking at the photos of you all enjoying yourselves in NYC. I bet you have fun visiting in NJ too! 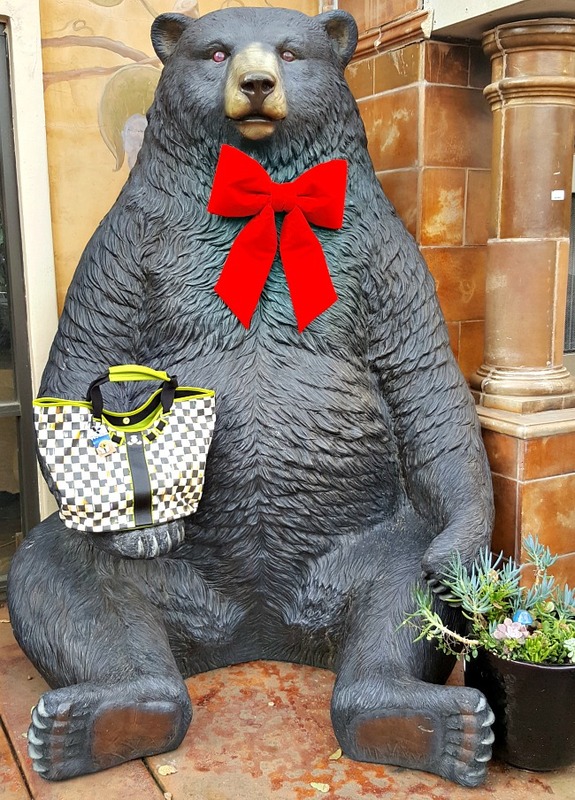 I'm looking forward to visiting some of the other bloggers and where the bags have been. Linda, it has been so much fun seeing the photos from y'all's trip to NYC. Thanks for putting this post together. You look fantastic, and I hope your dad is better. Your fireplace is one of the prettiest in all of bogland, WOW! I love it. You gals and your traveling totes are so cute! I love reading all about your adventures. Thinking I may need a traveling tote myself! :o)) Happy weekend! Lea, yes you should get a tote and join us! Fun for you gals anf dfor us to see..Miss Jacqueline is a perfect addition:) I am sure your new TTgals will simply add to all the fun! Linda, you girls and the totes had way too much fun! I love NYC in autumn! It was great that you could combine a visit to family, also! That is a wonderful photo of you! I enjoy this series from such a fun group of ladies! I have to admit that blogging is what turned me on to Courtly Check! And this trip was what made me want to become a part of the group - along with your sweet encouragement. 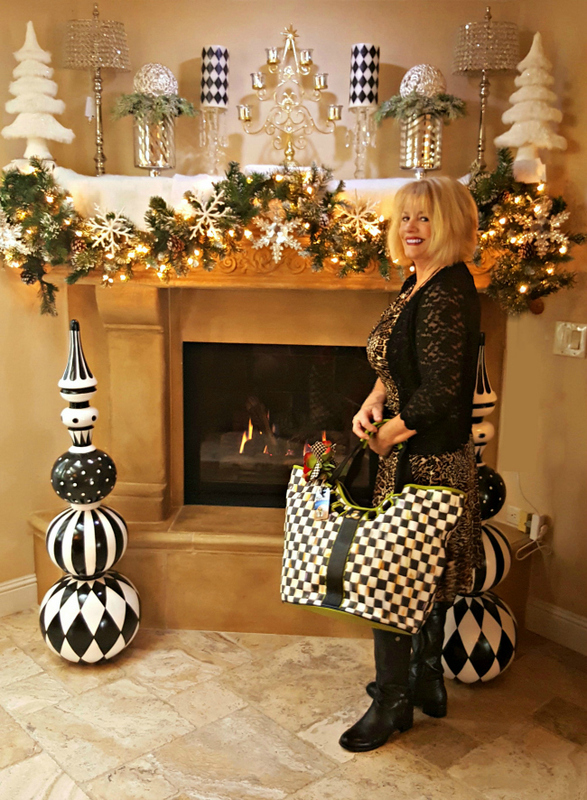 What a wonderful trip you had and wow do you look fabulous in front of the fireplace with Miss Lola! I love everything about it! Thanks for inviting me along. I can't wait to bring Miss Madi K all over the world! Such an amazing place to visit Linda you must had fun there. What a neat stocking! It’s so beautiful!